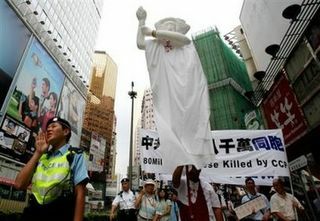 The “Goddess of Democracy” is resurrected at the Hong Kong protest on Sunday. She was the symbol of freedom at the Tiananmen Square Protests in 1989. Hundreds of people marched through Hong Kong on Sunday to denounce China’s bloody crackdown on pro-democracy protesters in Beijing in June 1989… a move that stunned locals in this then-British colony eight years before it returned to Chinese rule. One protest sign read “Seek accountability for the massacre.” Some demonstrators set a black coffin daubed with the message, “The stench of a butcher regime lasts 10,000 years,” outside the Chinese foreign ministry’s Hong Kong office. “It doesn’t matter if it’s been 10 years … or 20 years. As long as China doesn’t exonerate the protesters, we in Hong Kong will still hold this gathering,” said Wu Kwok-hing, a retiree in his 70s. China branded the 1989 student protest a counterrevolutionary riot and has stood by its decision to clear Beijing’s Tiananmen Square by military force. The massacre, in which hundreds, perhaps thousands, of protesters died, sent shock waves through Hong Kong, aggravating fears that China would extend its authoritarian rule to the territory when it took over from the British in 1997. 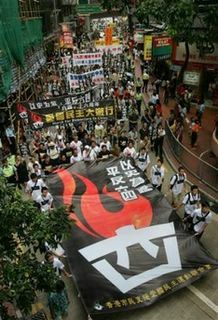 Protesters march in Hong Kong against the Communist Government’s role in the Tiananmen Square Massacre in 1989. Organizers said 1,400 attended Sunday’s protest, while police put the figure at about 1,000. Thousands showed up for last year’s demonstration, which came just weeks after China rejected calls for quick democratic reform in Hong Kong. A woman who answered the phone at the Chinese government’s liaison office in Hong Kong said no one was available for comment. An annual candlelight vigil commemorating victims of the 1989 massacre, usually attended by thousands, will be held on Saturday.